At the Open Quarterly Meeting (OQM) held February 26-28 in San Diego, the SBCA Marketing Committee embarked on an ambitious new effort to map the entire construction industry process through a series of flow charts. These flow charts will track the movement of information, labor, and products through the various supply chain stakeholders. The committee’s goal is to describe, from a high level to an increasing level of detail, the various touch points each professional has in a typical construction project (i.e., the builder, design professional, general contractor, subcontractor, building material supplier, raw material supplier, and building official). The committee understands this will be a huge undertaking but realizes the significant gains possible through a better understanding of the offsite framing and building envelope suppliers’ place in the construction supply chain. The component manufacturer (CM) will remain at the center of the flow chart, to illustrate the important role each CM plays in the construction process. Hence, understanding forward or backward integration of the supply chain is essential when contemplating fair compensation for meeting or exceeding your scope of work. An in-depth understanding of code-based and contractual scopes of work and how to graphically understand these processes should be very helpful. Today, almost every CM faces pressure to exceed its traditional scopes of work. This adds to both overhead costs and risks that may not be accounted for in a CM’s bid or, in some cases, insurance coverage. Additionally, the workforce development benefits of this project will allow CMs to better and more quickly educate new hires into their businesses. A secondary goal of this project is to give CMs a tool to clearly illustrate their role in the construction process. The resulting flow chart can show new hires, and maybe even some seasoned veterans, how their roles impact the overall construction process. It can also provide them insight into the proper channels to follow when they need to dialogue up or down the supply chain with customers, architects, engineers, framers, and other trades that may need information relating to a specific project. Through a better and quicker understanding of their role, employees will be more empowered and thoughtful when the need arises to interact with those outside their local company or location. As a starting point, SBCA will use ANSI/TPI 1-2014 Chapter 2, which defines the various roles in the supply chain, and graphically articulates responsibilities throughout the supply chain. From this basic yet powerful understanding, the flow chart will be expanded to explain the lifecycle of a typical project from conception to completion. Suppliers, subtrades, and various stakeholders will all hold a position on the flow chart. Indepth considerations of the intricacies of each individual market and project type (residential, commercial, agricultural, etc.) are necessary. As a result, input from a variety of SBCA members will be necessary to ensure this project encompasses various market approaches to the construction process. A subcommittee was formed during the meeting to act as a knowledge base for SBCA staff to rely on as work is performed for this project, but it was not fully developed and needs additional industry professionals from all over the country to ensure each market’s idiosyncrasies are captured. If you would like to volunteer for this subcommittee, please email editor@sbcmag.info to participate. This project provides a treasure trove of information for SBC Magazine to use to detail the variety of items to be considered through the stages of the construction process. Through a series of articles, SBC Magazine will explore how CMs impact each stage of the construction process, as well as learn how their products and technical guidance are used by the various supply chain participants. 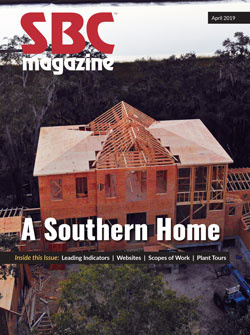 As the construction industry is disrupted through new entrants and new applications of technology, SBC Magazine plans to capture these changes and provide a lens through which CMs can focus on, adapt to, and participate in the changing construction market. To watch the progress of this project and track our work on supply chain processes and the value of each stakeholder, visit SBCA’s website. About the Author: Jess Lohse is a former CM and industry entrepreneur who lends his insights and expertise on the construction industry to motivate CMs to discover and develop new opportunities.